It’s a 2-year-old story. A community rallies around a neighbor with amyotrophic lateral sclerosis (ALS), more commonly known as “Lou Gehrig’s Disease.” Six swimmers take on the English Channel to raise money and ALS awareness in his honor. One of those six is diagnosed with stage 2 breast cancer four months before that swim but completes the challenge, anyway. A world record is broken. It’s a 2-year-old story. But its characters aren’t finished telling it. In 2008, when doctors told Bob Schoeni, a research professor at the University of Michigan, that they were 99 percent sure he had ALS, the father of two sat defeated. He figured he had two or three years to live before the debilitating disease would take him from his wife of 18 years, Gretchen Spreitzer, and their 8- and 10-year-old daughters. He realized he had some reassessing to do — how would he live his now certainly shorter life? What were his goals and aspirations? Would he and his wife go after a luxurious, world-wide bucket list? Would he try to pack decades of experiences into a shrinking timetable? At one point, the answer became clear to him: He loved the life he already had. That bucket list was being marked off by family dinners and fulfilling work and afternoons with his wife. If ALS’s aggressive symptoms were going to soon start taking their toll on him, he’d spend the remaining time living out his already perfect bucket list — researching and teaching, coaching his daughter’s youth field hockey team, and spending time with his family. How would he live his now certainly shorter life? Exactly as he had been. Schoeni and his family were already beloved in their neighborhood when they got the diagnosis. Proof of this were the neighbors who, less than six weeks later, approached them with an idea: they wanted to start a nonprofit — Ann Arbor Active Against ALS (A2A3)– to raise funds to find effective treatments and ultimately a cure for ALS. From A2A3 is where that 2-year-old story began, really. Because one of its board members, Amanda Mercer, a former swimmer at Michigan State University, one day got it in her head to form a relay team and swim the English Channel to raise $100,000 for ALS research. For a year, Mercer and five other swimmers trained. But in March 2012, four months away from the race, she found she was facing a larger, more terrifying challenge. “That word — ‘cancer.’ You hear it, and it just scares you. The unknown scares you,” Mercer says. She was tempted to surrender to self-pity. Then, she stopped herself. “I had to flip that perspective around because it wasn’t going to do me any good,” Mercer says. She went to her first doctor’s appointment with a calendar and a plan. She’d have a lumpectomy and begin her chemotherapy. She’d swim the Channel, come home and continue her radiation. Doctors told her they didn’t think she’d be able to make the swim — she’d be too tired from treatments. Mercer shook them off. “I was gonna swim that Channel,” she says. When Speitzer found out about Mercer’s diagnosis, she called her neighbor up. “Isn’t this actually the best timing?” Mercer replied. Speitzer was a little bit shocked. On July 27, 2012, those six women swam the 42-mile English Channel in a world-record time of 18 hours and 55 minutes — a feat captured in the documentary below, “One Step Ahead.” They raised $120,000 for ALS research. 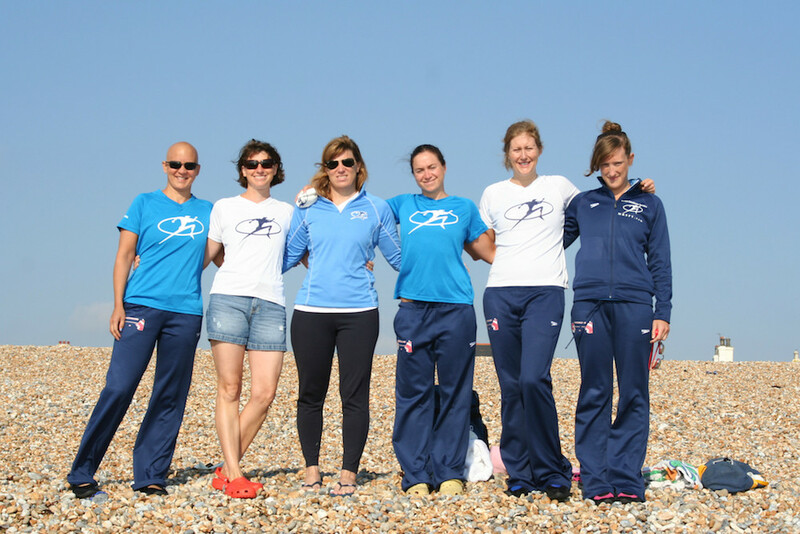 Amanda Mercer, left, with the relay team who conquered the English Channel. When Mercer returned home to finish her radiation, her eyes began to bother her. As a precaution, her optometrist sent her to an ophthalmic oncologist who suggested a cat scan, which later revealed the lining of an aneurism. They scheduled Mercer for a craniotomy, where they found that aneurism ready to burst. But they’d found and removed it just in time. 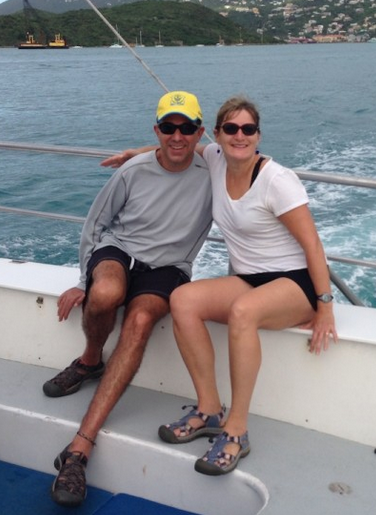 “In a strange twist of fate, breast cancer saved my life,” Mercer says. Today, she has a clean bill of health. It’s been two years since that swim, but Schoeni uses its memory to remind him that he and his family will always have support. He’s lucky, he says, because his symptoms have progressed slower than doctors anticipated. He’s learn to accept help — something he found difficult when first diagnosed. Schoeni will always tell his story to anyone who asks, but he’s hesitant to compare himself to others with ALS — he doesn’t want to be mistaken for the voice of the disease or to generalize the experience of having it. Watch “One Step Ahead” below. These 28 minutes are worth your time. One Step Ahead from Bob & Mary Kay Berg on Vimeo.